Remember that loooooonnnngggg, wet spring/early summer of 2015? Remember that relative non-winter of 2015-16? The fleas do, and they loved it. (The ticks have loved these seasons, too.) We’ve been seeing lots and lots of flea cases over the past number of months (yes, even through the winter and spring!). If a flea made it into your home during the warmer months, it doesn’t matter how cold it gets outside, that flea is loving your home environment. This is why we see flea cases year-round. What can be done to stop this? The answer: vigilant, regular flea control on all of the pets in the home. Adult fleas do not jump from animal to animal. They stay on the host. The eggs that female fleas lay do not stay on the host, but fall off into the environment. When the eggs mature through their life stages and are ready for a blood meal, they jump on the first host that comes by. The greatest concentration of fleas in your home will be where your pet(s) spends the most time. Treating the home environment will help to debulk the flea burden in the home, but without making the pets, the fleas’ hosts, dead ends for reproduction, the flea cycle will continue. How do you know if your pet has fleas? Within minutes of a flea jumping on a host they’ll take a blood meal, and very shortly after that they’ll pass stool (feces, poop). 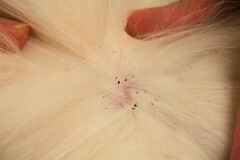 This is called “flea dirt” and the photo here illustrates what it looks like. If you get it wet, it will turn back to its original blood red color. After taking a meal, the female is fit to begin reproducing, and it doesn’t take long for that to happen, usually less than 24 hours. Adult females will lay around 30 eggs per day. Every day. These eggs fall off of the host, and when they fall into areas where they can be sheltered, such as carpets, blankets, bedding, floor mats, and upholstered furniture, they’ll begin to emerge through their life cycles. The pupae stage is particularly hardy, and they can remain dormant for up to nine months. Pupae are stimulated to emerge from by vibrations in their environment. I’ll refer back to this in a bit. Fleas prefer to take their meals from cats and dogs, not humans. If a human is getting bit in the home, the fleas are telling us that there is a shortage of preferable hosts because there is a HUGE flea burden in the environment. Recall that adult fleas don’t leave their host, and the people in the home are being bitten by the newly emerging fleas. Prevention is best, and waiting until you see a flea to begin treatment is too late. However, if you haven’t prevented, the best time to act is now. If you see flea dirt on your pet or in your home, fleas have already achieved a foothold. Some very good flea control products have come on the market in the last 15 to 20 years that are much safer than what was available in the 1980s and early ’90s. Never have there been safer, more convenient flea control products than today. Use a good, safe, effective flea adulticide. At the Cuyahoga Falls Veterinary Clinic, we have moved to Simparica®, an oral, flavored, treat-style treatment. Simparica® kills fleas within 3 hours (and ticks within 8 hours! 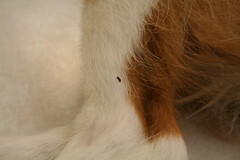 ), limiting the amount of time fleas are on your pet and inducing itch. Trifexis®, and Revolution® are also safe, effective products that we recommend for our patients. Use one of these products every month, year round, without break. If you do not use any of the products mentioned above on a consistent, monthly basis, and you are not using anything similar to them (ask us if you have questions) you are at risk for an infestation and recurring flea problems. The doctors here at Cuyahoga Falls Veterinary Clinic see many cases of flea-caused skin disease even in the winter! Treat the environment! The live fleas you see on your dog or cat only account for 10% of the total fleas in the pets’ environment. They are the tip of the iceberg. The rest of them are eggs, larvae, or pupae and they’re in the carpets, blankets, bedding, upholstered furniture, doormats, etc. You must tackle these as well if you have an infestation. First, remove as many eggs, larvae, and pupae from the environment as possible. Wash all bedding in the washer and dryer. Be sure to wash all pet beds, blankets, and all human bedding (if pets sleep on people’s beds) in the washer and dryer. Remember that part about pupae emerging in response to vibrations in their environment? Vacuum all carpets thoroughly early and often. For the particularly infested environments, we keep Mycodex House Spray in stock for treating carpets, blankets, bedding, etc. While it is an insecticide, this is nice because you can target the use of the product, and there is no wasted product. Using Mycodex will help debulk the immature flea burden in the environment and minimize the adults that will be seen in the coming months. Remember that part about pupae remaining dormant for nine months? Keep up with flea control all the time. Don’t take a break. Don’t take any months off. One last thing I want to re-enforce: It. Takes. Time. If your expectations are set appropriately, you’ll be pleased with the progress and results. A flea infestation is winnable battle. Don’t be stressed, don’t be frustrated. We can win the battle together! Questions? Call us at 330-929-3223!